contracted to the Department of Public Safety, SCF.Brandie Hyde is currently pursuing multiple Bachelor of Applied Science Degrees in Public Safety Administration and Homeland Security respectively from the State College of Florida. 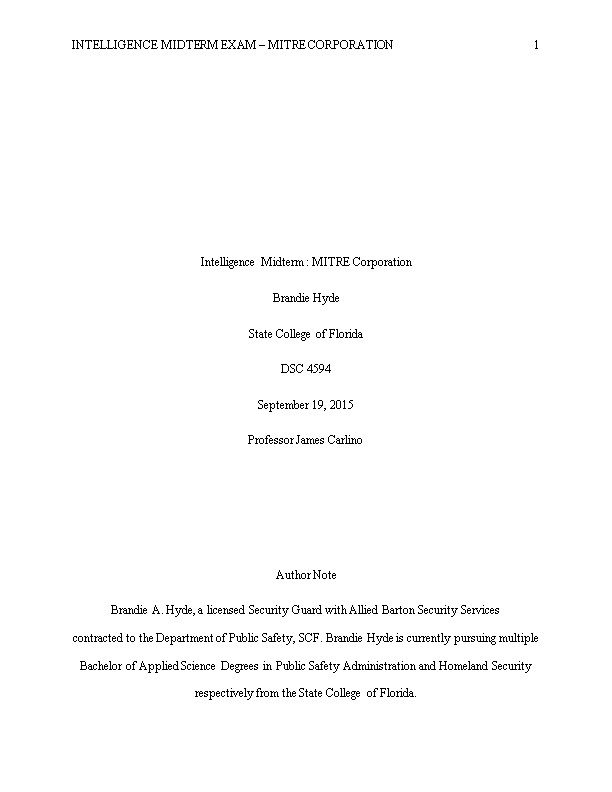 The objective of this assignment is to examine intelligence utilization of a private company, in this case MITRE Corporation, and to provide a report in regards to what it is that the company then does with the information, what their mission is and how they operate in general. Further, this assignment seeks to compare the MITRE Corporation intelligence to that of the U.S. by illustrating differences and similarities. MITRE Corporation’s various governmental departments ‘customers’ are referred to as ‘sponsors’ in part to reiterate their non-profit status as a whole, but also for the sake of brevity in communications. While operating exclusively as FFRDCs, the MITRE Corporation is still an independent company – that just so happens to specialize in governmental concerns, thus lacking commercial interests. “This lack of commercial conflicts of interest forms the basis of our objectivity. It also allows us to acquire sensitive and proprietary information from the government and industry to inform our work. These organizations are able and willing to share data because they know we won’t use it for a competitive advantage. For more than 50 years, the government has trusted us to serve in the public interest” (MITRE FAQ, 2013). MITRE’s Mission is that of a public interest company in that they work in tandem with not only industry but also academia in an effort to advance and apply science, technology, systems engineering, and strategy, and thus enabling both government and private sector agencies to make better informed decisions and in implementing solutions to the complex array of challenges facing our nation and others of global significance. This culture of knowledge sharing fostered by MITRE Corporation seeks to apply the lessons learned from addressing the challenges of one sponsor to those of others facing similarly related issues. In this way, when a governmental agency or ‘sponsor’ engages with MITRE Corporation, they have access and the ability to benefit from all of the talent throughout each of the FFRDCs. One way to think of it is that in this particular case, the proverbial ‘right hand’ does know what the ‘left’ is doing and as such, aren’t forced to ‘reinvent the wheel’ every time a similarly related issue arises for another FFRDC sponsor. That framework is available as a basis upon which to customize the ideal solution for that particular entity. A modern pop-culture comparison might be The Borg from television’s Star Trek: The Next Generation, in that what one member of the ‘collective’ or ‘hive’ learns and experiences is shared with every other member because of their interconnectivity thus making their adaptability unmatched. MITRE’s partnership with government agencies and applying systems engineering and advanced technology in an effort to address issues of critical national importance serve as the cornerstone of the organization. MITRE Corporation has the luxury of not having to face significant road blocks from neither government nor industry as is the case in terms of traditional intelligence gathering activities, which in itself puts MITRE at a distinct advantage due in no small part to its culture of knowledge sharing. MITRE serves as something of a ‘middle man’ separating government from industry from even academia while ensuring that the best interests of both are served and thus mutually beneficial symbiotic relationship for all parties involved. Also unlike governmental or military intelligence concerns, MITRE has the ability to verify their findings through alternate and non-traditional channels via the legal safeguards in place with the FFRDCs because of ample access to often what is sensitive or otherwise proprietary information, due to a lack of fear of impropriety or disclosure, thus allowing the FFRDCs to assist their ‘sponsors’ in acquiring the right technology, objectively assess business processes, and the integration of complex systems. The idiom about not being able to ‘see the forest for the trees’ is applicable in the context of FFRDC’s in that sometimes it takes an outside perspective to see what others too closely associated with the subject matter may have overlooked. Another example might be a writer who sends their work to a publisher which employs a proofreader and an editor before going directly to print. One way that FFRDCs enable industry to work more effectively with government is by making the technology they develop available to industry for production and distribution, providing examples such as jet propulsion flight and GPS technologies with roots stemming back to foundations in FFRDCs that the general public has likely benefited from directly. Unlike matters of vital national security handled by the government and military aspects of intelligence in which lives and mission successes can often hang in the balance, MITRE is capable of fostering discoveries to dramatically improve performance while reducing system costs and ultimately accelerating the delivery of products to the field. MITRE Corporation’s use of FFRDCs is something that more closely resembles a photo collage or some other group collaborative effort that isn’t so structured, rigid, or segregated by comparison. Also to MITRE’s advantage is that the ‘heavy lifting’ of presorting and evaluating the raw data has already been done by the time that information is shared with them from any source, but particularly U.S. intelligence. All in all; a comparison between the two simply isn’t fair, and yet, but are required for optimal return on investment. Lowenthal, M. (2015). Intelligence Analysis. InIntelligence: From Secrets to Policy(Sixth ed.). Thousand Oaks, California: CQ Press, an Imprint of SAGE Publications.